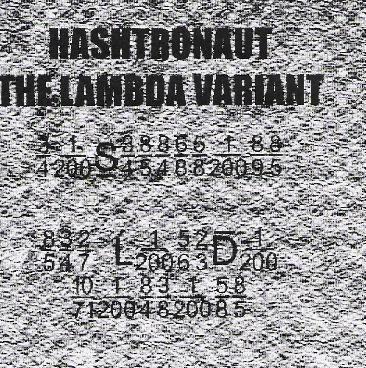 Hashtronaut - "The Lambda Variant"
I listened to some recent Klaus Schulze music not that long ago, and I thought to myself, man, this guy can probably do this stuff in his sleep by now. And maybe he does. I have to give him credit though, where Tangerine Dream veered off into a more lighter, new age instrumental pop direction in the 90's from which they've never recovered, Mr. Schulze has stayed true to form with his often seemingly endless electronic explorations. And while his recent output was indeed just that, it somehow seemed very mannered...as if Klaus Schulze set out to make some Klaus Schulze music, but without the heart and soul he poured into his earlier works. It was just kind of there. There is a point to me going on about a different artist's music for an entire paragraph in a review of this CD. It's because I am sure that Liverpool's Hashtronaut worships at the alter of Klaus Schulze. And hey, if you're going to emulate an artist, it may as well be one of the greats. But unlike Mr. Schulze, who seems to be composing on autopilot these days, Hashtronaut brings a vitality and energy to his music. It is full of passion. And that's what makes the difference. Now I'm sure there are some out there who would say, "how can it have passion, it's electronic music?" But it does. Well just listen to electronic music recordings from the 70's by artists like Klaus Schulze and Tangerine Dream, and compare it to what they are putting out now, and you will hear the difference. And that's the difference you can hear in Hashtronaut's sound. It may not be the most original music I've ever heard, but I love this kind of stuff, and when it's played with such passion, such strong belief in what the artist is doing, it really does make a difference. The Lambda Variant consists of two pieces around 25-minutes in length each. One of them is a studio composition and one of them is a live recording (indeed, the first ever live performance of the artist, which apparently came about pretty much by accident when another band failed to show at a concert). It's a nice combination. Track one, the title track, offers a little more variation in sound, whereas track two offers the rawer energy of a live performance. The opening cut starts with soft bell-like tones before percussion, multiple electronic sequences and washes of gurgling space sounds provide the backdrop for some serious synth melody explorations. Hashtronaut keeps it all minor key, which keeps it deliciously enigmatic (rather than having the tendency of Tangerine Dream from the mid-70's on to jump over into major key pop-like passages). The live track is sort of divided into two parts, the first, Church of Lambda, is a reverent, mysterious introduction with deep spacey organ sounds; the second, Lambda Ritual, a pulsing and rhythmic electronic journey. It's great stuff, and if you're a Klaus Schulze fan like myself, you will love it. For more information you can visit the Hashtronaut web site at: http://www.hashtronaut.net.